Honestly YA: Ten authors, One love. : YA Authors Hit the Road! One of the things I love most about YA is the connection the authors make with their readers, whether it's through tumblr, twitter, online Q&As, or any number of social media activities. But events like these? These are the AWESOMEST! 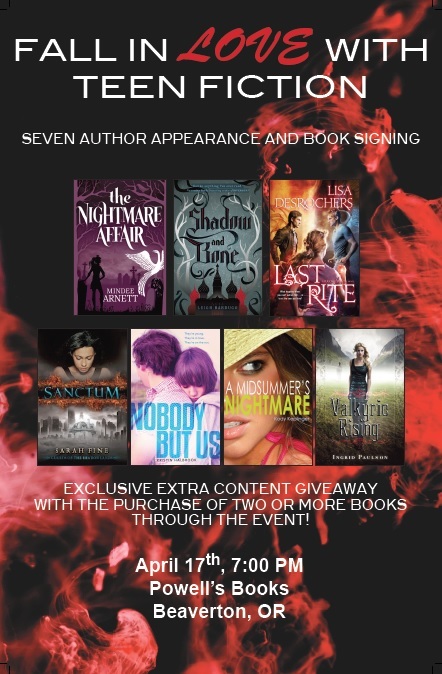 On April 17, authors Mindee Arnett, Leigh Bardugo, Lisa DesRoches, Sarah Fine, Kristin Halbrook, Kody Keplinger, and Ingrid Paulson arrive on the scene at Powell's Books in Beaverton Oregon. Sadly, I can't keep winging off to Oregon every time there's a fab author event. But if you're anywhere near there, Go Go Go! Readings, signings, general mayhem! And for attendees who purchase two or more books, an exclusive giveaway booklet of extra content by the participating authors. If you, like me, cannot get to Oregon due to trivial matters such as airline schedules, work, school, or general lack of a reliable means of transportation, YOU STILL HAVE A SHOT AT ONE OF THOSE BOOKLETS! Thanks to the cool crew and New Leaf Literary and Media, Honestly YA is giving you a chance to win your very own copy. Stop back TUESDAY (4/16), learn what the participating authors do when they're faced with heartbreak/disappointment. Don't miss this!